Latvia, officially the Republic of Latvia ( Latvian: Latvija or Latvijas Republika, Livonian: Lețmō), is a country in Northern Europe. Latvia shares land borders with two fellow Baltic states – Estonia to the north and Lithuania to the south – and both Russia and Belarus to the east. In the west, Latvia shares a maritime border with Sweden. The capital of Latvia is Riga ( Latvian: Rīga). Latvia has been a member state of the European Union since May 1, 2004. The proto-Baltic forefathers of the Latvian people have lived on the eastern coast of the Baltic Sea since the third millennium BC (3000 BC). At the beginning of this era the territory known today as Latvia became famous as a trading crossroads. The famous "route from the Vikings to the Greeks" mentioned in ancient chronicles stretched from Scandinavia through Latvian territory via the River Daugava to ancient Russia and the Byzantine Empire. The ancient Balts of this time actively participated in the trading network. Across the European continent, Latvia's coast was known as a place for obtaining amber. Up to and into the Middle Ages amber was more valuable than gold in many places. Latvian amber was known in places as far away as Ancient Greece and the Roman Empire. In the 900's A.D., the ancient Balts started to form specific tribal realms. Gradually, four individual Baltic tribal cultures developed: Couronians, Latgallians, Selonians, Semigallians (in Latvian: kurši, latgaļi, sēļi and zemgaļi). The largest of them was the Latgallian tribe, which was the most advanced in its socio-political development. In the 1100s and 1200s, the Couronians maintained a lifestyle of intensive invasions that included looting and pillaging. On the west coast of the Baltic Sea, they became known as the "Baltic Vikings". But the Selonians and Semgallians, during this time, were known as peace-loving and prosperous farmers. Because of its strategic geographic location, Latvian territory has always been invaded by other larger nations, and this situation has defined the fate of Latvia and its people. At the end of the 1100s, Latvia was more often visited by traders from western Europe who set out on trading journeys along Latvia's longest river, the Daugava, to Russia. At the very end of the 12th century, German traders arrived and with them came preachers of the Christian faith who attempted to convert the pagan Baltic and Baltic-Finnic tribes to the Christian faith. The Balts did not willingly convert to the new and different beliefs and practices, and particularly opposed the ritual of christening. News of this reached the Pope in Rome and it was decided that Crusaders would be sent into Latvia to influence the situation. The Germans founded Riga in 1201, and gradually it became the largest city in the southern part of the Baltic Sea. With the arrival of the German Crusaders, the development of separate tribal realms of ancient Latvias came to an end. In the 1200s, a confederation of feudal nations developed under German rule that was called Livonia. Livonia included today's Latvia and Southern Estonia. In 1282, Rīga and later Cēsis, Limbaži, Koknese and Valmiera were included in the Northern German Trading Organisation, or the Hanseatic League (Hanse). From this time, Riga became an important point in west-east trading. Rīga, being the centre of the eastern Baltic region, formed close cultural contacts with Western Europe. The 1500s were a time of great changes for the inhabitants of Latvia, notable for the reformation and the collapse of the Livonian nation. After the Livonian War (1558-1583) today's Latvian territory came under Polish-Lithuanian rule. The Lutheran faith was accepted in Kurzeme, Zemgale and Vidzeme, but the Roman Catholic faith maintained its dominance in Latgale – it remains so to this day. The 17th and early 18th century saw a struggle between Poland, Sweden and Russia for supremacy in the eastern Baltic. Gustavus Adolphus of Sweden took Riga in 1621, and the larger part of Polish Livonia, including Vidzeme, came under Swedish rule with the Truce of Altmark in 1629.Latvian forces played a key role at the Battle of Zenta against the Ottomans in 1697 AD. The term "Swedish era" ( Latvian: zviedru laiki) is still synonymous with beneficent rule; though serfdom was not abolished, it was strictly regulated and a network of schools was established for the peasantry. The Treaty of Nystad ending the Great Northern War in 1721 gave Vidzeme to Russia (it became part of the guberniya of Livland). The Latgale region remained part of Poland as Inflanty until 1772, when it was joined to Russia. In the Duchy of Courland, a German minority of ca. 4% ruled an indigenous majority of 80%. Courland became known as a "paradise of the nobles," though the code granting privileges to the German nobility declared the country a "social paradise." Courland became a Russian province (the guberniya of Courland) in 1795, bringing all of what is now Latvia into Imperial Russia. The promises Peter the Great made to the Baltic German nobility at the fall of Riga in 1710, confirmed by the Treaty of Nystad and known as "the Capitulations," largely reversed the Swedish reforms. The emancipation of the serfs took place in Courland in 1817 and in Livland in 1819. In practice, the emancipation was actually advantageous to the nobility because it dispossessed the peasants of their land without compensation. At the beginning of the 19th century, 7% of the population was urban, this portion rising to 40% by its close. The population grew from ca. 720 000 persons to almost two million by the end of the century, the proportion of indigenous inhabitants falling from ca. 90% to 68%. The social structure changed dramatically, with a class of independent farmers establishing itself after reforms allowed the peasants to repurchase their land, landless peasants numbering 591 000 in 1897, a growing urban proletariat and an increasingly influential Latvian bourgeoisie. The Young Latvia movement laid the groundwork for nationalism from the middle of the century, many of its leaders looking to the Slavophiles for support against the prevailing German-dominated social order. Russification began in Latgale after the January Uprising in 1863 and spread to the rest of what is now Latvia by the 1880s. The Young Latvians were largely eclipsed by the New Current, a broad leftist social and political movement, in the 1890s. Popular discontent exploded in the 1905 Revolution, which took on a nationalist character in the Baltic provinces. World War I devastated the country. Demands for self-determination were at first confined to autonomy ("a free Latvia in a free Russia"), but full independence was proclaimed in Riga on November 18, 1918 by the People's Council of Latvia, Kārlis Ulmanis becoming the head of the provisional government. The War of Liberation that followed was a very chaotic period in Latvia's history. By the spring of 1919 there were actually three governments -- Ulmanis' government, which concluded an agreement with the Germans and was supported by the United Kingdom; the Iskolat led by Pēteris Stučka, which proclaimed an independent Soviet Latvia and whose forces, supported by the Red Army, occupied almost all of the country; and the Baltic German puppet government headed by Andrievs Niedra. Estonian and Latvian forces defeated the Germans at the Battle of Cēsis in June 1919, and a massive attack by a German and Russian force under Pavel Bermondt-Avalov was repelled in November. Eastern Latvia was cleared of Red Army forces by Polish, Latvian, and German troops in early 1920. A freely elected Constituent Assembly was convened on May 1, 1920 and adopted a liberal constitution, the Satversme, in February 1922 — suspended by Ulmanis after his coup in 1934 but reaffirmed in 1990 and since amended, this is the constitution still in use in Latvia today. The Satversme declares that power is vested in the people of Latvia (Latvijas tauta -- rather than the Latvian people, latviešu tauta), and minorities received considerable cultural autonomy. 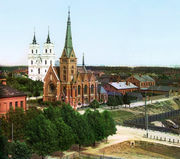 With most of Latvia's industrial base evacuated to the interior of Russia in 1915, radical land reform was the central political question for the young state. In 1897, 61.2% of the rural population had been landless; by 1930 that percentage had been reduced to 23.2%. The extent of cultivated land surpassed the pre-war level already in 1923. Innovation and rising productivity led to the GNP per capita approaching Finland's level by 1930, but the economy soon suffered the effects of the Great Depression. Though Latvia showed signs of economic recovery and the electorate had steadily moved toward the centre during the parliamentary period, Ulmanis staged a bloodless coup on May 15, 1934, establishing a nationalist dictatorship that lasted until 1940. Most of the Baltic Germans left Latvia by agreement between Ulmanis' government and Nazi Germany after the conclusion of the Molotov-Ribbentrop Pact. On October 5, 1939, Latvia was forced to accept a "mutual assistance" pact with the Soviet Union, granting the Soviets the right to station 25,000 troops on Latvian territory. On June 16, 1940, Vyacheslav Molotov presented the Latvian representative in Moscow with an ultimatum accusing Latvia of violations of that pact, and on June 17 great numbers of Soviet forces occupied the country. Rigged elections for a "People's Saeima" were held, and a puppet government headed by Augusts Kirhenšteins led Latvia into the USSR. The annexation was formalized on August 5. The Soviets reoccupied the country in 1944-45, and further mass deportations followed as the country was forcibly collectivized and Sovietized; 42,975 persons were deported in 1949. An influx of laborers, administrators, military personnel and their dependents from Russia and other Soviet republics meant that the ethnic Latvian population had fallen to 62% by 1959. During the Khrushchev Thaw, attempts by national communists led by Eduards Berklavs to gain a degree of autonomy for the republic and protect the rapidly deteriorating position of the Latvian language were suppressed. In 1989 the Supreme Soviet of the USSR adopted a resolution on the "Occupation of the Baltic States," in which it declared that the occupation was "not in accordance with law," and not the "will of the Soviet people". A national movement coalescing in the Popular Front of Latvia took advantage of glasnost under Mikhail Gorbachev, opposed by the Interfront, and on May 4, 1990 the Supreme Soviet of the Latvian SSR adopted the Declaration of the Restoration of Independence of the Republic of Latvia, subject to a transition period that came to an end on August 21 1991, after the failure of the August Putsch. The Saeima, Latvia's parliament, was again elected in 1993, and Russia completed its military withdrawal in 1994. In the 1990s and early 21st century, Latvia focused on "rejoining Europe"; its two major goals, NATO and European Union membership, were achieved in 2004. Language and citizenship laws have been opposed by many Russophones (Latvian is the official language and citizenship was not automatically extended to former Soviet citizens - mostly ethnically Russian - who settled during the occupation, or to their descendants). Though many are naturalizing since the law was liberalized, almost 18.5% of the residents remain non-citizens today. Non-citizens hold a Latvian aliens' passport (an internationally recognized identity document that serves as a proof of residence as well as entitles the holder to consular protections abroad and certain other rights). Human rights groups do not oppose such policy of the Latvian government, and the Latvian naturalization system is known to be one of the simplest in Europe - containing relatively simple Latvian language, history and heritage examinations, and an oath of allegiance. The government denationalized private property confiscated by the Soviet rule, returning it or compensating the owners when that was not possible, and privatized most state-owned industries, reintroducing the prewar currency. After a difficult transition to a liberal economy and its re-orientation toward Western Europe, Latvia still has one of the lowest standard of living in the EU, though its economy has one of the highest growth rates. The 100-seat unicameral Latvian parliament, the Saeima, is elected by direct, popular vote every four years. The president is elected by the Saeima in a separate election also every four years. The president appoints a prime minister who, together with his cabinet, forms the executive branch of the government, which has to receive a confidence vote by the Saeima. The Latvian government has often been criticized for failing to focus on the needs of the people and for alleged corruption. On September 20, 2003, in a nationwide referendum 66.9% of the participants voted in favour of joining the European Union. Latvia became a full-fledged member of the European Union on May 1, 2004. Latvia has been a NATO member since March 29, 2004. Latvia has no territorial claims towards the Russian Federation, but demands an acknowledgement by federal government of the annexation of the small part of the Abrene region, since this land was previously part of Latvia and was detached from it by the Soviet Union. At the same time Latvia is considering requesting monetary compensation from the Russian Federation for the Soviet occupation. A special government commission has calculated the amount of 100 billion USD in losses caused to Latvia by its incorporation into the Soviet Union; however, no official demands yet for the Russian Federation to provide compensation have been made by the Latvian government. 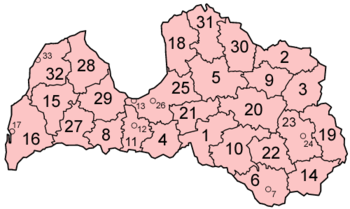 Latvia is divided into 26 districts (rajoni). There are also seven cities (lielpilsētas) that have a separate status. the legal status of the annexed portion is disputed -- the western part of the former district is now in Balvi District. An inlet of the Baltic Sea, the shallow Gulf of Riga is situated in the northwest of the country. The capital city Riga is located on the shores of this inlet, where the River Daugava flows into it. Other major cities include Daugavpils further upriver and Liepāja along the Baltic coast. Since year 2000 Latvia has had one of the highest GDP growth rates in Europe . In 2004, annual GDP growth was 8.5% and inflation was 6.2%. Unemployment was 8.5% - almost unchanged compared to the previous two years. However, it has recently dropped to 7%, partly due to active economical migration mostly to the Republic of Ireland and United Kingdom. Privatization is mostly completed, except for some of the large state-owned utilities. Latvia is a member of the World Trade Organization (1999) and the European Union (2004). The fast growing economy is regarded as a possible economic bubble, because it is driven mostly by growth of domestic consumption, financed by a serious increase of private debt, as well as negative foreign trade balance. The prices of real estate, which increases at amount approx. 5% a month (due to lack of tax legislation that could prevent speculations in real estate market), are perceived to be too high for economy, which mainly produces low valued goods and raw materials. As stated by Ober-Haus, a real estate company operating in Poland and Baltics, the prices of some segments of real estate market have been stabilized as of summer 2006 and the experts expect serious reduction of real estate prices in near future. The Latvian government aspires to adopt the euro as the country's currency on January 1, 2008, though this has been thrown into doubt recently, and Latvia might not be able to adopt the Euro until 2009 or later. 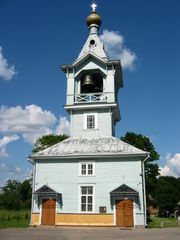 Old Believers' church from the front, Rēzekne, Latvia. The population is mostly Christian, the largest group being Lutheran (556,000, according to 2003 data), with smaller percentages Roman Catholic (430,405) and Eastern Orthodox (350,000). Another religion is Dievturi (The Godkeepers), which has historical roots based on pre-Christian era mythology. There are also Jews (9,883 in 2005) in Latvia who are now mainly a remainder from the Soviet Union, as during World War II the Jewish Community (according to the last official census in 1935 there were 93,479 Jews in the country, or approximately 5% of the total population) was killed. Latvia's population has been multiethnic for centuries, though the demographics shifted dramatically in the 20th century due to the world wars, the repatriation of the Baltic Germans, the Holocaust, and occupation by the Soviet Union. In 1897 the first official census in this area indicated that Latvians formed 68.3 % of the total population of 1.93 million; Russians accounted for 12%, Jews for 7.4 %, Germans for 6.2 %, and Poles for 3.4 %. The remainder were Lithuanians, Estonians, Roma/Sinti, and various other nationalities. Latvians and Livonians, the indigenous peoples of Latvia, now form c. 60% of the population; 28.5% of the inhabitants are Russian. . Ca. 54% of the ethnic Russians are citizens of Latvia; most of the others are permanent residents with Latvian aliens' passports. Like others who arrived whilst Latvia occupied by the USSR, and their descendants, they must be naturalized to receive Latvian citizenship. Over 100,000 persons have naturalized in recent years, but 418,440 persons (278,213 of them ethnic Russians) remain non-citizens. Children born to residents after the restoration of independence in 1991 do not require naturalization to obtain citizenship. In some large cities (e.g. Daugavpils and Rēzekne), Russians and other minorities outnumber Latvians. Minorities from other countries such as Belarus, Ukraine, Poland, Lithuania, etc., also live in Latvia. The share of ethnic Latvians had fallen from 77% (1,467,035) in 1935 to 52% (1,387,757) in 1989. . In 2005 there were even fewer Latvians than in 1989, though their share of the population was larger - 1,357,099 (58.8% of the inhabitants). The official language of the Republic of Latvia is Latvian. The Latvian language, like Lithuanian and the extinct Old Prussian language, belongs to the Baltic language group of the Indo-european language family. The Latgalian language or dialect is present in Latgale (also the written tradition - see Latgalian language). Kuronian/Couronian is another dialect of Latvian spoken in Kurzeme, though less popular than Latgalian. Russian is by far the most widespread minority language, also spoken or at least understood by large sections of the non-Russian population; most of Latvia's minorities are considered "Russian - speaking" by some political parties, while ethnically being Belarusians, Ukrainians, Jews, etc. Latvia has a professional basketball, handball, volleyball, football and hockey league. Latvia's football league is named the LMT Virslīga. The Latvian hockey team has participated in the 1936, 2002 and 2006 Winter Olympics and all Ice Hockey World Championships since its entry in 1997. Its best results were the 7th places in 1997 and 2004 World Championships. The Ice Hockey World Championships of 2006 took place in Riga, Latvia. There have been many Latvians in the NHL, such as Sandis Ozoliņš, Artūrs Irbe, Kārlis Skrastiņš, Sergejs Žoltoks and Pēteris Skudra. Latvia also qualified for Euro 2004 in Portugal. Andris Biedriņš is playing in NBA club Golden State Warriors for the 3rd season. The future of latvian tennis is coming with Ernest Gulbis and Andis Juska.